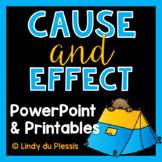 Also included in: Cause and Effect: A Bundle of Activities! 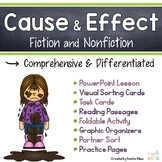 I originally created cause and effect PowerPoint for elementary ELL (ESL) students. I have used it across elementary grades K-5 and ability levels. Shows visual images depicting real life cause and effect situations with transitions and labels. 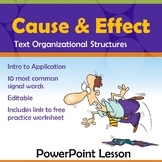 Great presentation to understand and identify cause and effect. 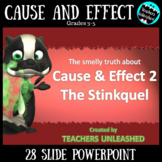 This presentation offers students the opportunity to identify cause and effect in a colorful and fun way. 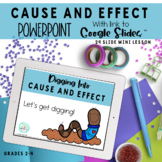 Great introduction to Cause and Effect! 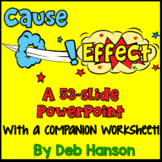 Includes 9 helpful slides for students to understand and practice cause and effect. Interactive and eye-catching for the students. Winter/Christmas themed practice sentences. This Powerpoint was designed to accompany the Second Grade Trophies selection, "The Day Jimmy's Boa Ate the Wash". It may also be used to teach the skill of cause and effect. 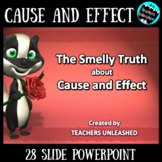 This is a twenty-two slide PowerPoint explaining cause and effect. It has several examples for the students to see and fill in either the cause or the effect for the situation. This PowerPoint includes animations.